What Are Good Tank Mates for Tetras? Tetras come in many varieties, and most are relatively peaceful and easy to care for, making them popular in community freshwater tanks. Although tetras offer a wide variety of sizes, shapes and colors, most aquarists add other species for additional interest and balance. 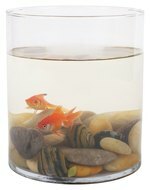 An ideal tank mate for your tetras will coexist with them peacefully, thrive in similar aquarium conditions, and will not pose a threat with their size. How Big Do Tetras Get? It's important to know which species of tetra you are talking about when you are deciding on species that will coexist well with your tetras. The smaller tetras, such as neon, lemon, ruby, serpae, black phantom, cardinal and glowlight tetras, typically grow no larger than 2 inches and are a favorite in many community tanks. You would not want to put tetras with oscars and gouramis, which can grow quite large and will likely consider them prey. The majority of tetra species are in the midrange size and typically don't get longer than 3 inches. This group includes black skirt, bleeding heart, Buenos Aires and Congo tetras. Large tetras, such as long-finned and bucktooth tetras can grow to 4 or 5 inches. Tetras in the mid-to-large range often do quite well with smaller types of cichlids like African cichlids and angel fish. The best tank mates for small tetras are other small tetras. Because they are rarely aggressive with other species their own size, and because they like similar environments, tetra species co-exist well together. Choose types that provide a variety of colors and fin shapes for your tank. Platys, guppies and mollies make good tank mates for both small and midsize tetras. They are colorful and easy to maintain, like tetras, and are generally nonaggressive toward other species. They like a planted tank with rocks, ceramics and other places to hide yet plenty of space to swim, and they eat much the same food as tetras. Larger tetras are usually peaceful and enjoy having other tetras around. They also do well with danios, corydoras, discus fish, most livebearers and some peaceful dwarf cichlids, such as apistogrammas. Like most other tetras, they are hardy and easy to maintain. Bottom feeders and algae eaters are important members of a healthy aquarium. They clean the tank of waste and help keep down algae growth. Catfish species, corydoras and raspboras, a member of the carp family, provide this service for your tank. The plecostomus is another important bottom feeder. Although this one can grow quite large, he will not bother your other fish. Having a tank that's too small for the number of fish you keep is one of the primary reasons that fish will show aggressive behavior toward each other. A rule of thumb is to provide a gallon of water per inch of fish. 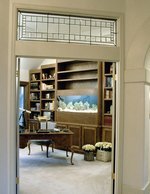 For example, a 20-gallon tank could house approximately 20 inches of fish. This means you wouldn't want to put more than about eight neon tetras and three mollies together in a tank that size.